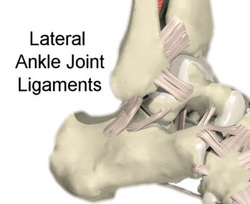 Most ankle sprains and strains occur when the foot twists inward, damaging the lateral ankle joint ligament. Sprains are graded according to the amount of damage to the ligaments: mild, moderate, or severe. Initial treatment often consists of rest, ice, elevation, and immobilization, but may also include anti-inflammatory medications such as ibuprofen, physical therapy, and cortisone injection. Ankle fractures are more serious and may need surgical treatment. Even after a fracture heals there may be arthritis that develops in the ankle joint. New ankle joint implant procedures are available to help restore motion in the joint and decrease pain.